combinations is free of charge. Light chain distressing on Tinted Varnish with glaze combinations is free of charge. on this page Heritage door style in Maple finished in Ivory Cream with Chocolate glaze and Cottage Distressing. Shown with optional five-piece drawer headers. 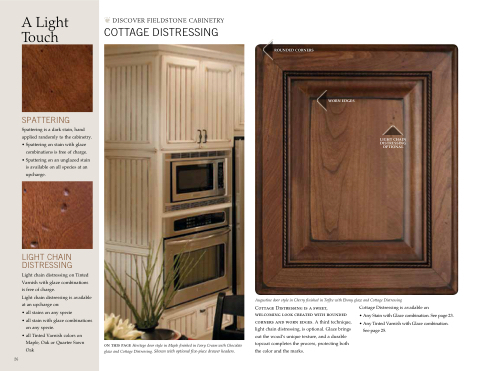 Cottage Distressing is a sweet, welcoming look created with rounded corners and worn edges. A third technique, light chain distressing, is optional. Glaze brings out the wood’s unique texture, and a durable topcoat completes the process, protecting both the color and the marks. • Any Stain with Glaze combination. See page 23. • Any Tinted Varnish with Glaze combination.